There’s the fix (we hope) for the latest Office 2013 install bug. The most recent set of security fixes from Microsoft includes a nasty surprise for some Office 2013 users. Microsoft isn’t telling much about the problem, not even which patch is causing the trouble. No clues about who specifically might be affected or the cause. All they’ll say is that “less than 1% of our user base” are affected (note the careful wording of that phrase). The true extent of the problem is only known to Microsoft and they have every reason to underestimate the problem. The bug affects some people with Office 2013 that’s installed using ‘Click to Run’ the streaming install that’s mostly used by Office 365 subscribers. If you can start Office 2013 without trouble then you have nothing to worry about. This is the same ‘friendly’ but useless error message that’s plagued Office 2013 since the beginning. Their advice to use Repair just doesn’t work at all and there’s no detail (an error code or other detail) to pass along to support people. The Microsoft ‘solution’ is to uninstall then reinstall Office 2013. You might think that’s easy, just go to Control Panel, Programs and Features and choose Uninstall for Office 2013 – but no. To properly uninstall Office 2013, Microsoft has a separate Knowledge Base article with ‘Fix It’ download. http://support.microsoft.com/kb/2739501/en-us . If that doesn’t work then there’s a series of complex steps to uninstall. After uninstalling Office 2013, try reinstalling it. The problem with Microsoft’s suggested fix is that the buggy patch will reapply itself automatically and you’ll be right back where you started from! Their suggestion (widely repeated in the media) is really just the old support standby ‘uninstall then reinstall’ (similar to ‘Turn it off and turn it on again’) and hope that the problem will go away. 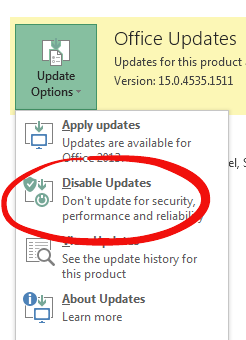 All Microsoft will admit is that something in the June 2014 security patches will cause this error when you restart Office 2013. Like most Office 2013 install/startup errors, this message is quite unhelpful. There’s no details of the problem that a customer can pass along. The ‘fix’ isn’t really a fix at all. It’s just a standard ‘try this and see if it helps’ suggestion. It took until the end of business on Friday (13 June 2014 at 6:04pm) for Microsoft to admit to the bug. At least 3 days after they first became aware of the problem. Was this done to avoid bad publicity by burying the news after most tech journos have gone home for the weekend? Where’s the Knowledge Base article? The KB used to be the place to go for bug and fix information and officially it still is. These days the KB is often ignored and what little detail Microsoft will release is given in a blog post or online forum. Even then, the blog post could not bring themselves to publish the workaround for the ‘high priority’ problem. Instead there’s a link to a public forum where customers affected can look through the posts for a solution. Perhaps Microsoft’s reluctance is because the forum workaround is simply to uninstall the buggy patch then reinstall Office 2013. The ‘fix’ may work, the results appear to be mixed. It’s good that Microsoft is admitting to the patch bug. Not so good for the unhelpful and slow announcement.